Gen X and Gen Y donors currently comprise 30 percent of total donated dollars. They are willing to be advocates; they share where they give with their friends, spread the word, and (with the help of a little smart technology on the nonprofit’s side) will mobilize new donors to causes they love. From 2012 to 2014, social fundraising grew by 32 percent, and 50 percent of Gen Y donors say they’ve posted about a nonprofit on social media. They hold the future of philanthropy. Looking beyond 2020, these donors will inherit more than $30 trillion over the next 30 years; the organizations they fall in love with now are ones they’ll likely support for years to come. No American visiting India for the first time really knows what to expect. The India that one visualises from the descriptions of travel websites, friends, and relatives is one of stark contrasts between clean and polluted, modernity and tradition, rich and poor. So, before I came to India, I didn’t know what to expect. 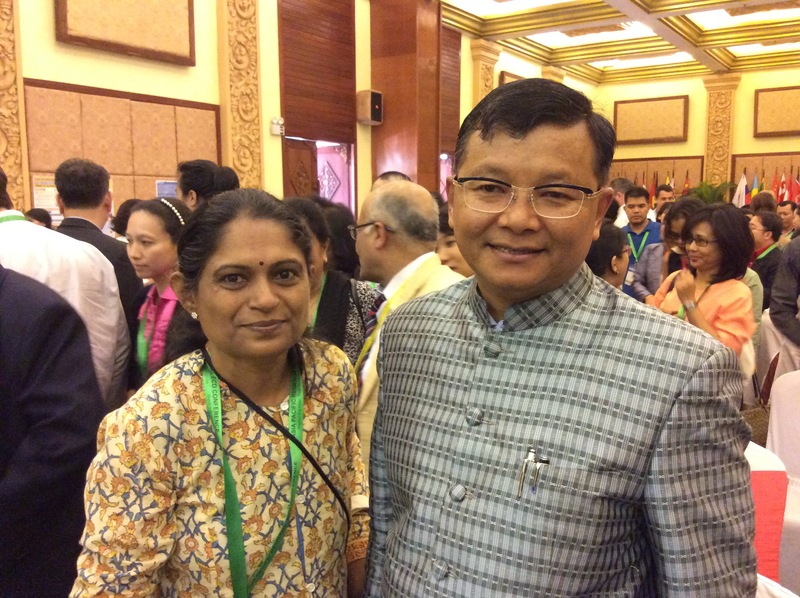 My name is Ajay and I am an Indian-American high school student on his first visit to India. On this trip, I was fortunate enough to have had the opportunity to join the Akshara Foundation on visits to the villages of Mundargi and Kushtagi in north Karnataka. The rides to the villages were long and bumpy on roads that varied in levels of maintenance. For much of the ride, I had my left hand firmly grasped around the ceiling handles of our SUV and my eyes glued to the window, seeing life in a rural area for the first time. The countryside can be very beautiful. 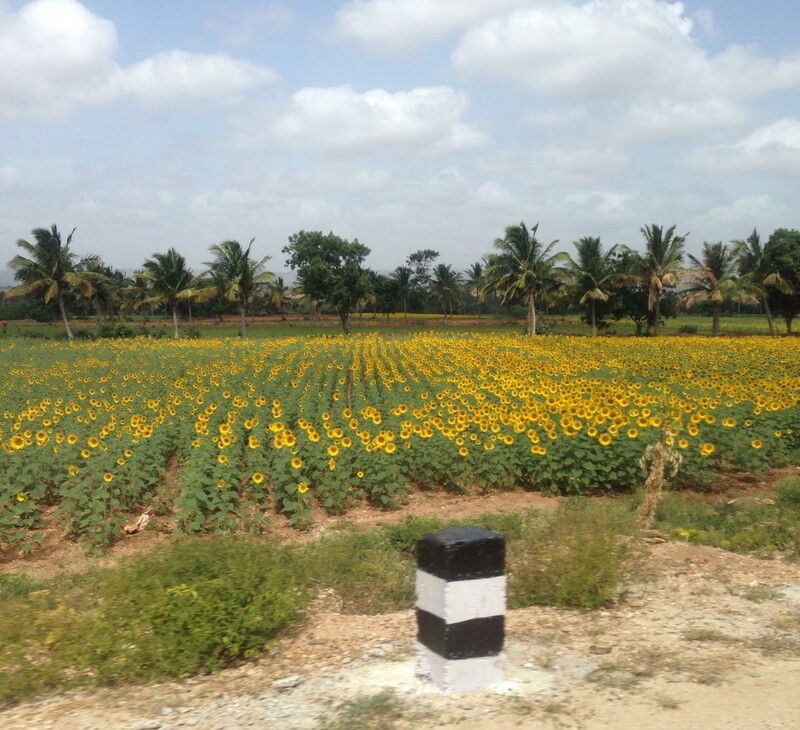 Agricultural fields cover the sandy landscape with green crops and bright yellow carpets of sunflowers. These fields seem to stretch forever, only briefly interrupted by the villages they sustain. The villages have their own beauty, with the vivid colours painted on the walls of homes and local shops. Buildings are constructed into small, but pleasant and reliable, structures from the materials readily available, such as wood and mud brick, showing the resourcefulness of these poor communities. The members of these communities were warm and welcoming to us, opening their home to us in an instant. 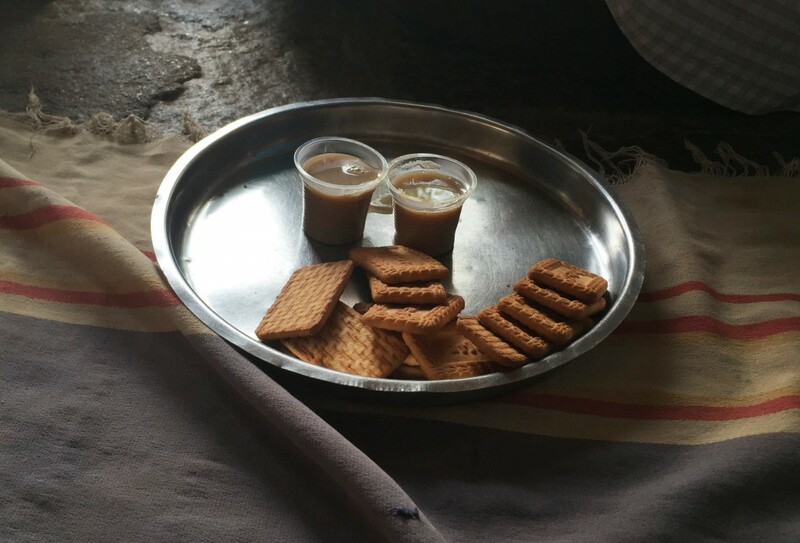 I’ve never been a big tea or coffee drinker – I’m fairly energetic on my own, without caffeine but by the end of the two days I was in rural Karnataka, I was converted. Everywhere we went, either tea or coffee was generously offered (and how can you pass up South Indian coffee?). The beverages not only literally warmed my mouth (I think I actually burned my tongue on the first day – helpful tip: when drinking a hot liquid, don’t keep it in your mouth in hopes of it somehow cooling down), but also, metaphorically, my heart; despite their daily struggle for food and water, these villagers offered me tea/coffee and biscuits without hesitation. However, these same villagers, the parents of the children we visited in local schools, did not seem to understand the full importance of their children’s education. 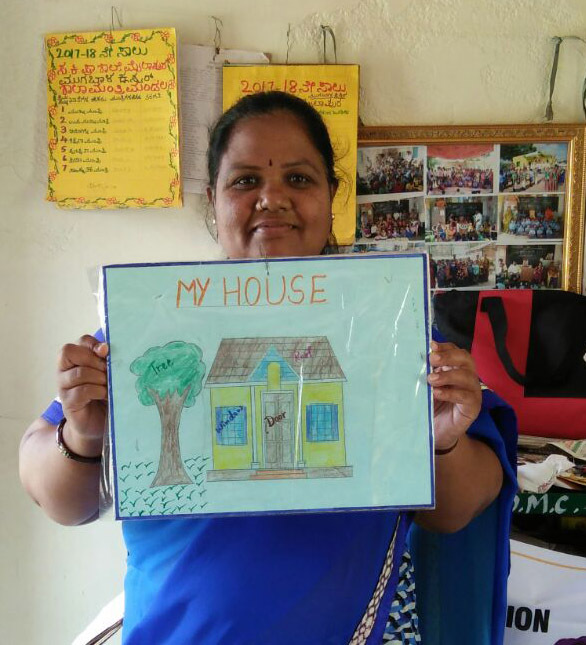 During their house visits, Akshara conferences with the parents about the importance of education and convinces families of why they should be involved in their children’s education. When basic necessities are scarce, it is understandable that parents can find it difficult to prioritise homework over harvesting. But a good education is a necessity. 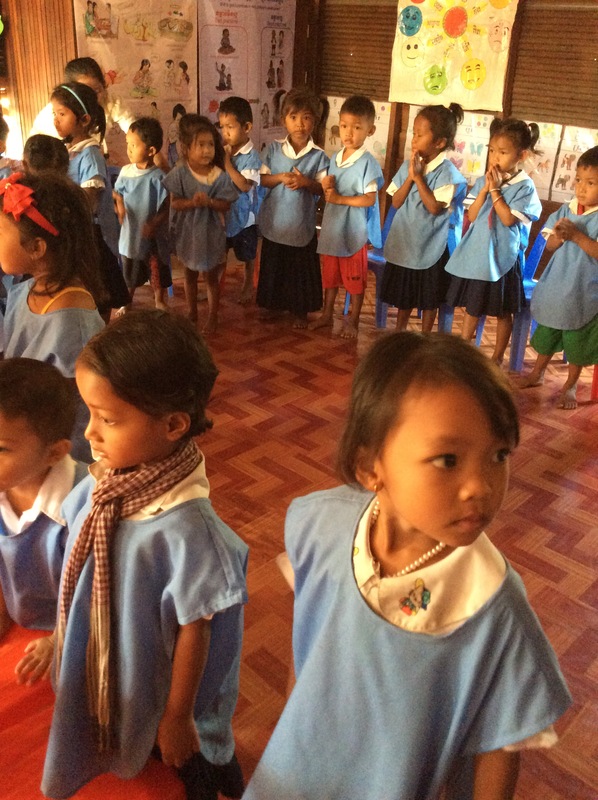 Certainly not of the immediacy of food or clean water for basic survival, but education is a necessary investment we make today to ensure that these children do not have to worry about things, like food shortages, in the future. In the United States, parents are, unfortunately, also often distanced from their children’s education. Some parents work too much to be able to find time to monitor their child’s learning. Others simply can’t be bothered. Either way, the effects on the child’s education are the same: the parents’ lack of involvement is an impediment. While in both America and India, parental involvement is generally directly correlated to income level, the difference is that in America, the trade off is rarely – if ever – between survival and education. Americans, in general, have more than enough to survive. The young students in Mundargi and Kushtagi dream of becoming teachers, doctors, engineers – not farmers or labourers that struggle to get by. This is why it is important not only for the students to have an education available to them in school, but also for the parents to support their children’s quest to build a better life for themselves and, eventually, the villages they come from. And this is why Akshara’s work is so essential. 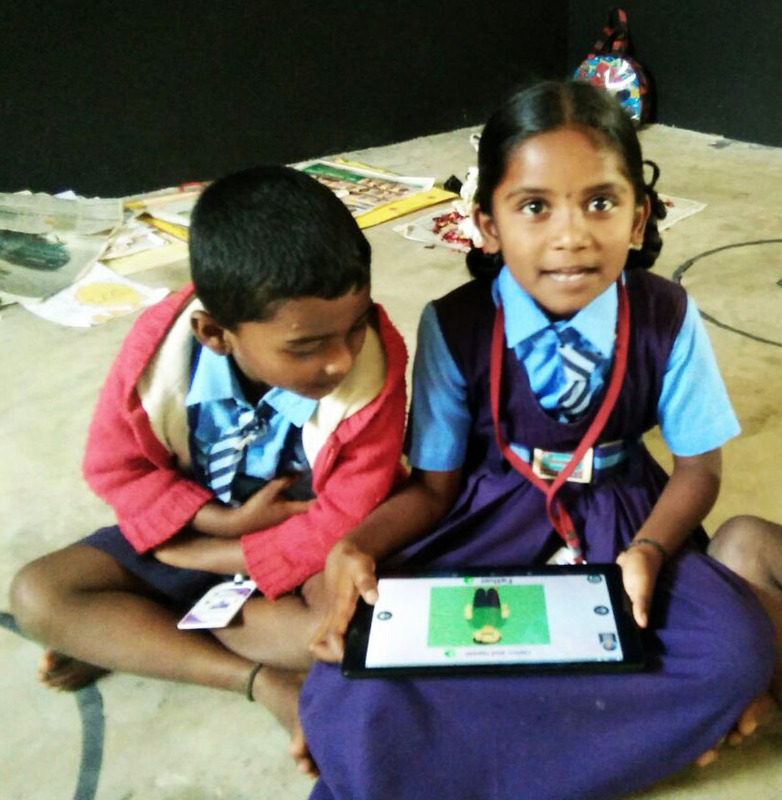 By building relationships with the communities in which they work, Akshara is able to make meaningful change at the deepest, most fundamental, levels. They invest time and effort into providing an education to children today, and changing attitudes and mindsets to ensure the next generation will have an education tomorrow. Serious about education and want to make it matter? Just ask for it. My friend Vanessa, in one of her mails, strongly recommended that I read The Art of Asking by Amanda Palmer. A little Google home work and I decided to add it to my long list of `to read’ books. After all Vanessa had used many superlatives while talking about the book. Online results too were positive and what really clinched it for me was a TED talk by the author herself. A bit of trivia like, spouse name – Neil Gaiman also helped. A former street performer, then Dresden Dolls front woman, now solo artist, singer-songwriter-blogger-provocateur – the lady commanded attention. Interested and fascinated, I lingered on longer than I had planned to, reading more about Amanda, her past and present. My college mate who was visiting me from New York after almost a decade decided to gift the book to me – a gesture to mark the re-union and to affirm that I am part of her inner circle of friends whose likes and dislikes mattered to her. So among the many things that Amanda talks about in her book on how to stop worrying and let people help, here’s what served as food for thought for both me and her – The Art of Asking was a great reminder that asking anyone, for anything is really an exercise in community building. When you don’t cultivate that community continuously, asking is more difficult. I brooded over this for a while and figured that even though my current job at Akshara Foundation does involve `the art of asking’ – asking for volunteers, donor funds, evaluation and impact results and the more routine asks, I have seldom seen it as an art. In terms of using it as an exercise in community building, I have not even ventured anywhere close to it. Working for a non-profit – a sector where we are constantly talking about community development, relationships between different stakeholders, we are under such great pressure to set things right in the moment, that we often overlook what the cause means to us and others at a personal level and how we can all come together on shared meanings.. It is then that the desire to connect and engage with the community at a much personal level took shape. 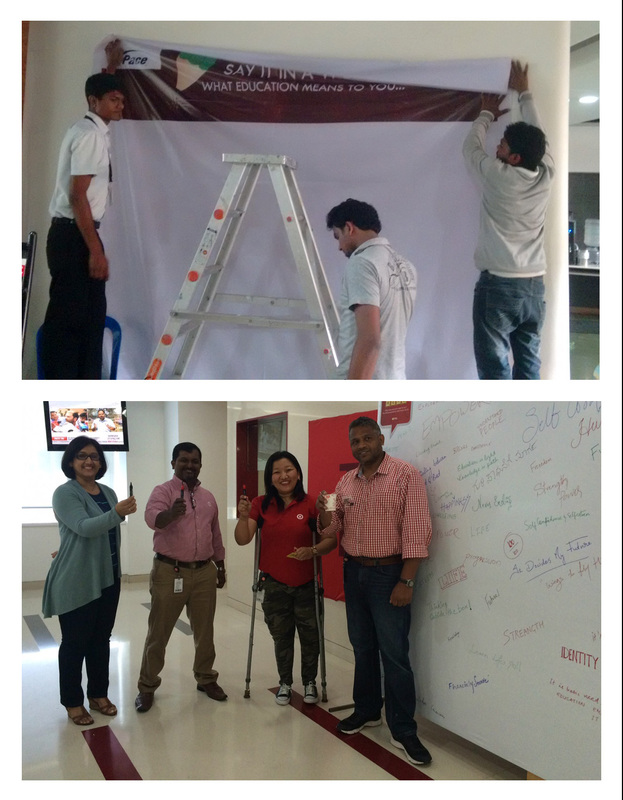 I decided to begin with each member of our donor community at Target India and Pace Technologies. 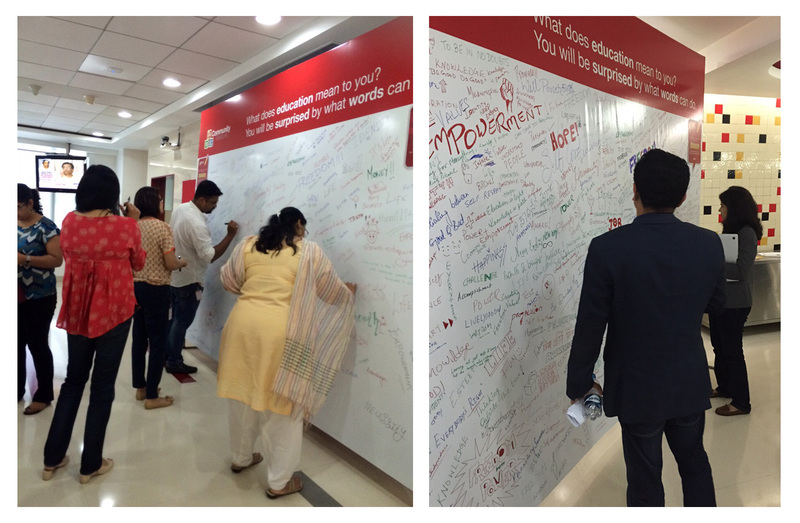 I asked them – what does education mean to you? A fairly simple question, which each of them could answer in one word if not many. After all, they have been supporting the cause of every child in school and learning well with us. 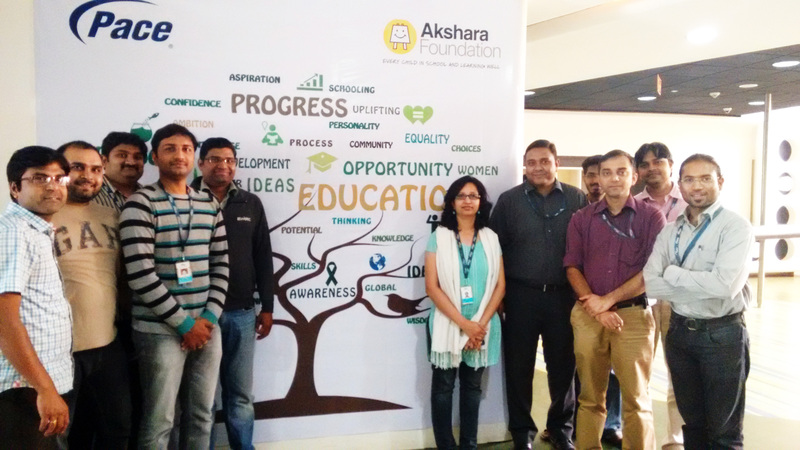 The support from the CSR teams at Pace Technologies and Target India, to take it to each member of the organisation provided the much needed impetus to create this community of people who care about the cause. So up went the flex board and as the day progressed, people milled around the flex board, sharing their thoughts and beliefs. I saw the shift happen. Those present were no longer alone. There was coffee, conversation and connection. Came in some stories too, questions, inquiries and signing up for volunteering followed. By the end of the day, I had built a personal connection with a community of nearly 3000. 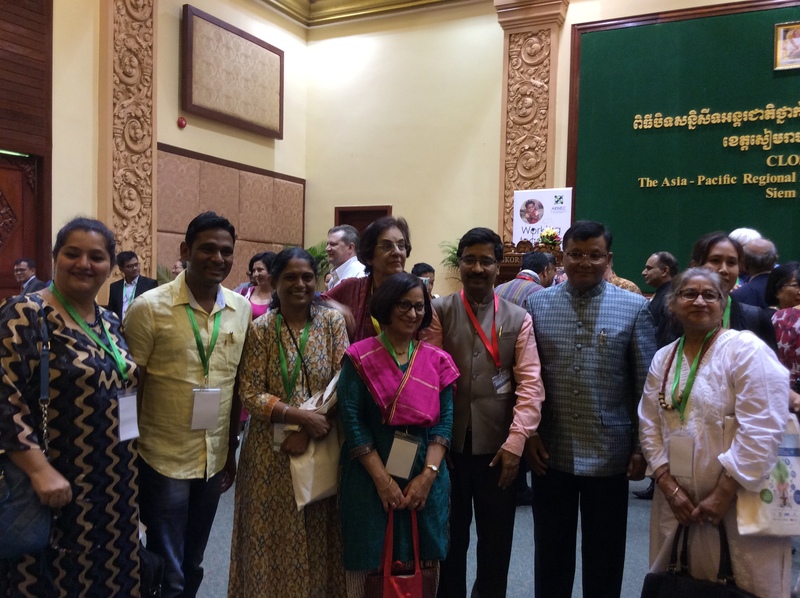 Not only were we talking of a common cause but also of collective ideas. Here was a community I was able to engage with easily. Going a step further the same community also offered their creative interpretations of what they had shared. Would they have told if I hadn’t asked? Would they have shared if I hadn’t reached out? What did it take to enable that surge of mutuality? A call, an ask, an announcement…a bridge never too far…. N.B. – Amanda Palmer besides being an extraordinarily talented musician, is also a fellow champion of open culture and believer in making good work freely available, trusting that those who find value in it will support it accordingly. Something, we at Akshara Foundation too believe in and are part of Creative Commons. Everyone has an opinion on education. Start a conversation at a dinner table, a tea shop, an academic seminar, a global conference, a train, a bus or flight – everyone you meet will have something to say about it. Often, they will know precisely how bad it is, how much worse it has become and what needs to be done to fix the ills. When I say precisely, I don’t mean that – I mean with a great deal of authority. Very definite and well articulated opinions. And they may well be right. Because nobody can really answer (most of) the big questions in education in India with any degree of precision. The holy grail here is evidence based policy making. It would obviously be great if every decision made had a solid basis in proven hypothesis. If we knew for sure, to take a facetious example, that children study better in white shirts than blue shirts, and this had been tested rigorously, then it would be easy to create a policy that tends towards white shirts as school uniforms. This is also better for policy makers as they have the evidence to fall back upon and even justify their decisions. In practice of course evidence is just one part of the policy making puzzle and may even prove to be inconvenient in some circumstances. Yet, it is what stands closest to fact in the vast unknown. The first hurdle of course is the availability of data. There is some available on the ministry website and some with affiliated institutions. Some data is gathered in large studies such as those conducted by the Azim Premji foundation, Pratham, Accountability Initiative etc. and these answer specific questions each year. The Karnataka Learning Partnership and Centre for Civil Society are taking the lead on compiling some data that are available to all while investors and private consulting firms have their own data sets that are not available in the public domain. Each of these serves a limited purpose and researchers often find themselves stuck because they have no credible information sources or good data unless they set up a data collection process themselves as part of their studies. That is either very expensive and time consuming or forces them to dramatically reduce the scope of their work. The lush and vibrant IIT-Bombay campus was abuzz with activity as it welcomed the alumni and students for its 54thFoundation day. The occasion was graced by former President APJ Abdul Kalam. Dr Kalam took this opportunity to talk about research and research opportunities in the country. He also spoke about highlighting the importance of entrepreneurship in the field of education. The distinguished alumnus awards were awarded to nine former students Nagesh Palepu, Neera Adarkar, Jayant Sabnis, Daniel Dias, Amarnath Bhide, Shantanu Khosla, Ashok Kamath, Satyajit Mayor and Satyendar Pakhale. While the other awards were given were for excellence in the field of Technology, Ashok Kamath, Chairman, Akshara Foundation received this award for his efforts in the field of education. This is an inspiring story of Asma who chose to make a difference in her own little way and emerged triumphant. In an inner enclave beyond busy main roads lies Nehrupuram, its streets scrupulously clean, no garbage heaps, big and small, that Bangalore struggles to clear every day. It is a thriving community that lives here, with a hunger for self-advancement. 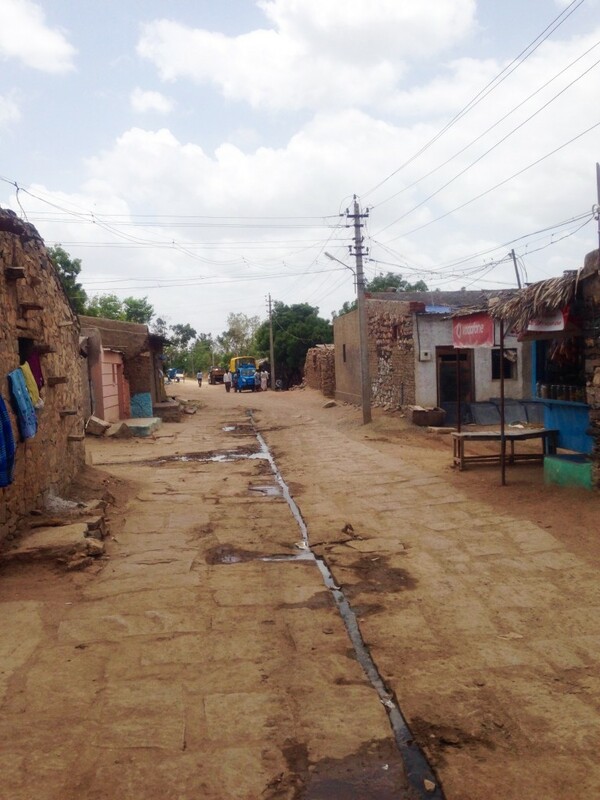 Asma Moosa lives here and is a stellar example, a compulsion for public good driving her. The prospect of being stranded at home and doing housework after completing school was not an enticing one, and her mother was already planning her marriage. Asma, in her characteristically mild way, refused to be typecast, to fit into preordained moulds. This simply meant her family was not willing to send her to work. However, an independent Balwadi being a home based venture made things easy for Asma. This simply meant giving back to society while ensuring a modest personal economic stability along with family support. Asma was quiet familiar with Akshara and the work they were doing. This was when she approached Fatima, an Akshara librarian in a government school nearby. This was indeed the turning point of her life and she realized her true calling. Akshara’s training for independent Balwadi volunteers not just trained her but also opened new avenues for Asma. It taught her skills she never knew she needed – managing children, extracting the best out of them, helping realize their potential. 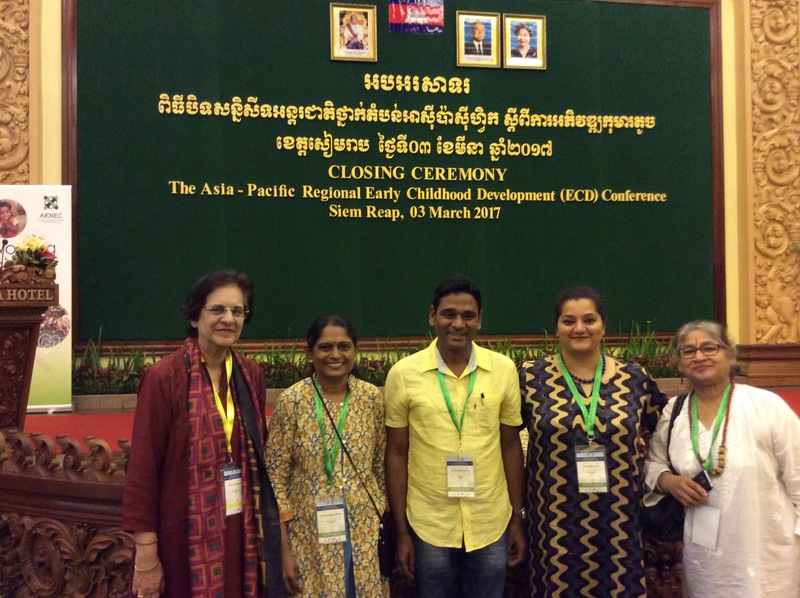 The significance of preschool education and how it builds foundations for later development was new to her, and she never knew so much was possible with teaching-learning material. It had seemed like child’s play opening a balwadi. Now she knew what it meant. Most importantly the training taught her how to harmonise an entrepreneurial streak with community service. Asma set up her balwadi in a room in her mother’s house. 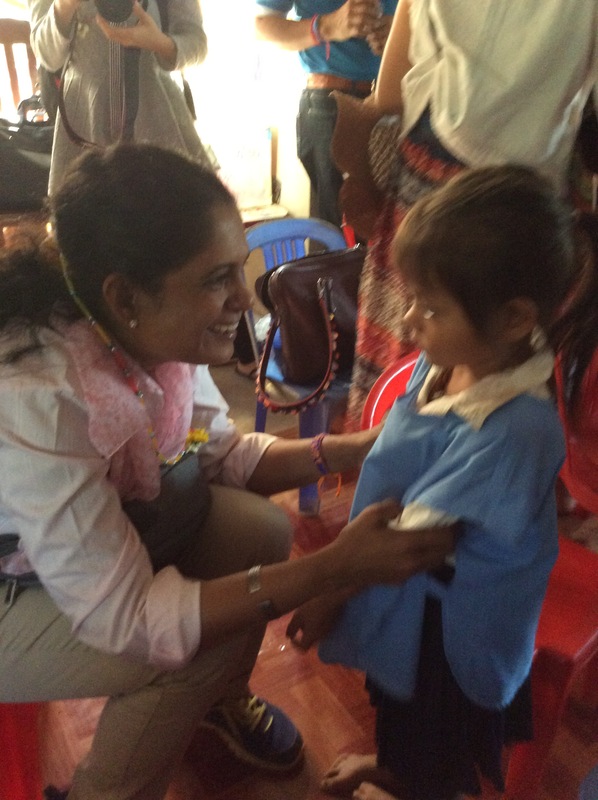 Akshara provided her with everything she needed to start a preschool. All the teaching-learning material, books, forms, registers, identity cards for the children, even pins and clips, she happily quips. She was out in the community every day searching for children for her balwadi, coaxing parents. “Only three children turned up on the first day,” she says, quietly reliving what could easily have turned into a disaster. Her house-to-house searches for children and persuasions in the community yielded steady results. Asma’s hard work, and a slowly spreading acknowledgment of it, paid off. Soon students began trickling in and the number changed from 3 to a bunch of 40 kids. Asma charged Rs. 50 per student. She was the proud recipient of a trophy from Akshara for drawing the highest number of children in the first year of operations. Asma’s marriage in 2008 seemed to shadow her success as her husband did not want her to work but her dogged determination won. Today Asma operates out of a new multi-storeyed building the Maulvi of the mosque next door has provided her. Her balwadi has grown. She has 135 students in four sections – pre-nursery, nursery, Lower Kindergarten (LKG) and Upper Kindergarten (UKG), all compartmentalized and in distinct sections with separate curriculums. Asma runs an English medium preschool. It is a professional set-up. If her balwadi has grown so has Asma. 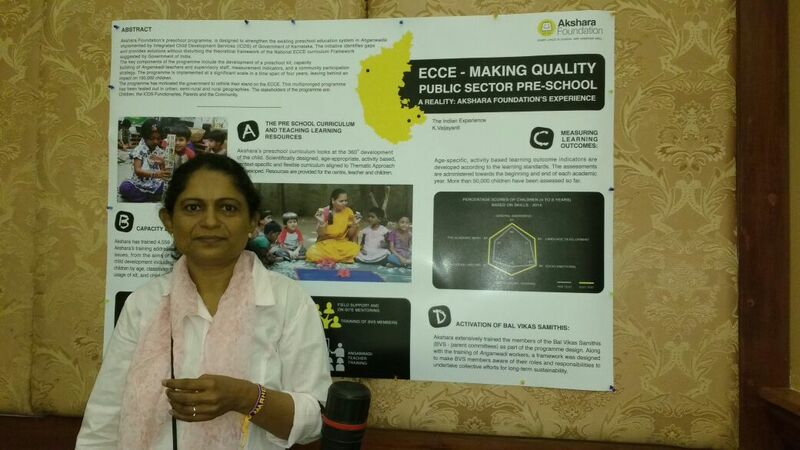 She has a big reputation for preschool education in Nehrupuram. “I am famous in this area because of Akshara. And yes, people acknowledge me as a good teacher,” she says with humility. What has made this journey possible? It is her never say die attitude and hard work. She hopes to be a role model and make her school an ideal example for others to follow. In spite of her rise and the position she holds in her community Asma maintains her humility. She herself laid down terms for herself, but with sensitivity. Today, her 3 ½ year old son does not study in her balwadi because he cannot accept his mother as a teacher, is looked after a lot of the time by her mother, leaving Asma free to shoulder her work. It indeed is a two-way street but she manages it all with dedication and sincerity. Asma negotiated with her family for that work-space in her life, to be allowed to do something better, larger, meaningful, without cutting off relationships. “If women are not allowed to go out and do something they can do it at home. But women should do something. They play a decisive role especially in education”.